The R.O.A.D.S.T.A.R. (Really Old Auto Dislodges Surfboards To Aerially Rock) is the ultimate spy gadget: a car that converts into a plane. It includes a 2.5" figure (Numbuh One with samurai gear) and some awesome accessories, cool sound effects and concealed wings. 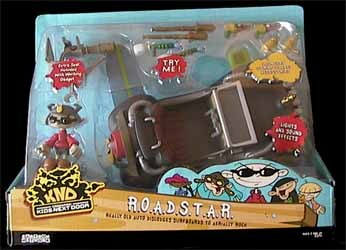 I might not be the best person to review this toy as I've never actually seen an episode of KND. In fact, I was totally unaware of its existence until this toy was hurled at me by our strict reviews editor. However, once I'd checked this toy over professionally [Pushed it up and down his desk making "Brum! Brum!" noises - Reviews Ed] I quickly made sure that I watched the show. Not only is this toy manufactured to an exceptionally high standard (well, this is F.E.V.A, what did you expect? ), but it's also incredibly clever in it's construction. All of the weapons and vehicles in this range are made to look as though they have been created by kids from common household objects - a bit like a junior A-Team, if you like. The R.O.A.D.S.T.A.R. 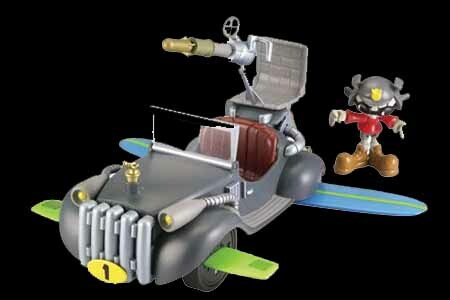 comes complete with a heap of weapons (including projectiles that can be launched from the spring loaded cannon, and a selection of handheld guns which can also be fitted onto the car), retractable wings, engine and jet sound effects, a light up jet, and a hidden mystery projectile. The detail is amazing, even down to the car's steering wheel - which simply turns over to produce a yoke flight stick. And any of the other 2.5" action figures in this range can also be used with this car (there is even a spare seat for a gunner). Whether you've seen KND or not, you can't argue with the fact that this is a beautifully produced quality toy.